As promised, I'm going to post 5 more layouts today. Most are simple, but a couple of these may look familiar as they were past classes or kits that I finally got to add pictures to for Emily's scrapbook. But first, I thought I'd post this simple man(ish) Valentine card that I threw together. It's for a soldier that Emily's kindergarten class has adopted. I actually timed myself making this card, and from zero ideas to totally finished, it took me 40 minutes. And that is FAST for me as I am notoriously sloooooow!!! This was super easy, and the details are below the pic. Manly Valentine card. The card itself was cut from A Child's Year at 6 1/2". So many great card options on that cart!!! 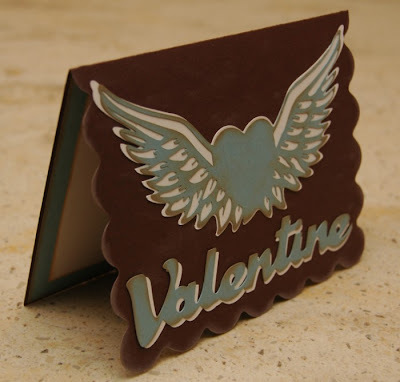 The winged heart and "Valentine" were cut from Love Struck. Winged heart was cut at 3", and "Valentine" was cut at 1 1/2". I inked everything, and added a blue and white frame on the inside, which Emily got to write on. 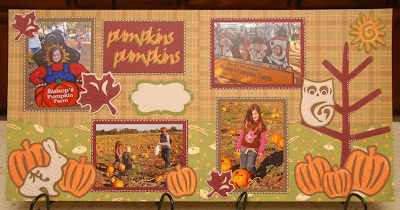 Pumpkins, Pumpkins layout was made with my GYPSY!!!! Aren't you proud of me? Most cuts were from Gypsy Wanderings. The journal box, though, was from Storybook. And now I'm blanking on the font, which I welded. It may have been from the Calligraphy cart. 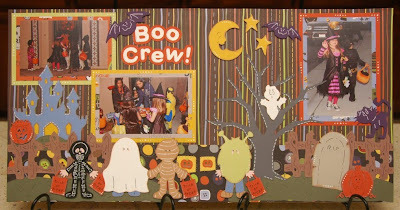 Boo Crew layout may look familiar. 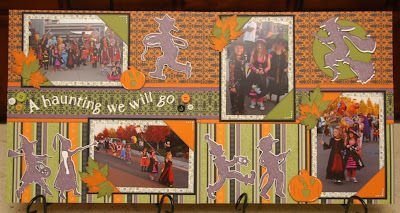 I did this as a class and kits this past fall. (I still have a few kits left.) I used Paper Doll Dress Up for everything except for the title, which was the HK Font. I love that font since it's bubbly, and has a nice chubby shadow to it. This was a Limited Edition kit that I released on Halloween, and sold out in less than a day. Bunch of crazy Halloween junkies out there! All cuts are from A Child's Year. Have I ever mentioned how much I LOVE that cart? Mwah! Paper is SU. 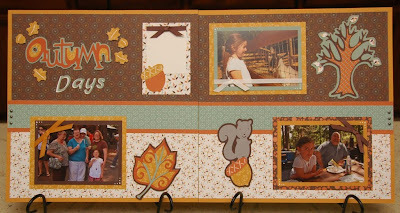 An ancient kit I released long ago, which I think looks much cuter with pictures in it. Most cuts were from Stretch Your Imagination, including "Autumn". The word "Days" was from Printing 101. 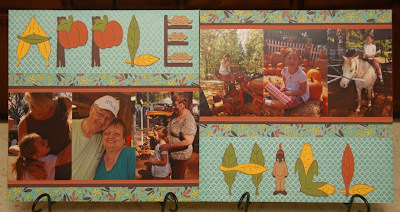 Apple Hill layout made with Speaking of Fall. Pretty sure I've never before spent so much time making a title for a page, LOL! Don't forget to check back tomorrow as I'll be introducing my latest Limited Edition Layout "Bee Happy". And happy it is!!! 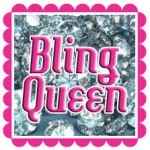 Plus Thursday I'll be reviewing the Above Rubies Studio DVD "Cricut A-Z" and will even have a giveaway to go along with it!!! But wait - there's more! 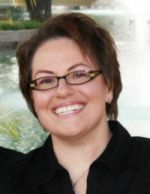 I will also soon be introducing my very first Guest Designer, Wendy Lawrence. Yup, that's Wendy who went to CHA with me and is in all the crazy pictures. She's a brilliant designer in her own right, and I can't wait to show off what she's making. Wow!!! Your stuff is so beautiful!! I am really looking forward to seeing Wendy's stuff! She is just the greatest!!! Those are beautiful layouts! The card is awesome as well. I wish I was as talented as you! WOOHOO!!! Great stuff!!! And I can't wait to see Wendy's creations!!! Wow! You sure have been busy! I love each and every layout! Great papers! Beautiful layouts, Monique. I can't wait to see your Bee one. Love the card and of course your layouts are superb as always. Love how you come up with so many little extras that really make it. What a great card! Mannish, but I like it too (can't help thinking of that old Irish Spring commercial) lol. I love that cut from Love Struck, but I did it with a black heart (yes I'm a pirate from wayyyy back lol).